The journey begins with two file drop target components -- one for CSV files and one for Excel files. An additional group of components (group_5), consisting of a button group and a visibility toggle, enable the user to select between the file drops. Each time the button group is clicked, the visibility toggle will hide one file drop and reveal the other. 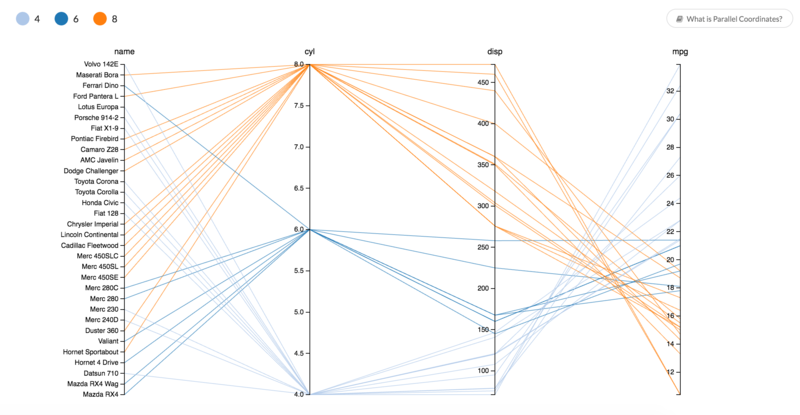 Again, if you're working with a large number of samples and variables, the parallel coordinates visualization may be hard to read. To help with this problem, a group of components lets the user to filter the data to only show a certain number of variables (the axes) at a time. Once the file drop components parse the files, they will send the data as a duffle to group_0, which generates UI elements and handles the filtering process. Group_0 consists of four components, the one of which is a Port Configuration component. This component reads the duffle from the file drop, and provides the user with a dropdown to select which axes to show in the vis. When a user makes a selection, that information is passed to a Multiplex Configuration component, which generates a string to configure the Parallel Coordinates component with those selected axes. Because this duffle is working as a selector for the Parallel Coordinates component, it is known as a "duffle selector." The Multiplex Configuration component in group_0 also needs a list of the original attributes as strings sent to its defaultAttributes port. So a third component, the get duffle attributes component, finds all the unique attributes in the data, and sends that data as a duffle of attributes to a merge gate. The merge gate then turns the duffle of attributes into a list of attributes, which gets passed on to the Multiplex Configuration component. Finally, a fourth component in group_0 called Radio Buttons generates a list of radio buttons from the same duffle of attributes from the Get Duffle Attributes component. The user can again pick from attributes, but this time the action will set off a series of events that colors a sample's line according to one of the attributes. For the exploring fuel economy in mtcars data, a logical choice for the color attribute would be "cyl", which is the number of cylinders in the car's engine. There's only three variations of cylinders in this dataset; a car has an engine with either 4, 6, or 8 cylinders. Since there are only three variations, there will only be three different colors of lines, making it easier to spot trends based on groupings of cars with the same number of cylinders. Group_0 lets the user select which axes to show and set how lines are colored in the visualization, but group_6 is the group of components that actually applies those color attributes to the data. The group consists of a data merge gate wired to a D3 Color Map component, which in turned is wired to a data gate. This duffle is passed to a Color Legend component, and also is sent to the data input of the Parallel Coordinates component. This is the data that Parallel Coordinates draws from to create a visualization. From the original file drop, to components in group_0 and group_6, and finally on to the data and axes inputs on the Parallel Coordinates component, mtcars' data journey is complete. Well, almost complete. Clicking and dragging the mouse over an axes will select a sample, causing Parallel Coordinates to output just the data from those samples. That output is filtered, then received by a table component, which produces a table of those samples on the page. An additional group of components, called group-1, creates buttons and allows the user do download the selected samples as an Excel file. Handy, if you'd prefer to drill down on only a select number of entities. What does all this tell us about the mtcars data? Whittling the data down to name, miles per gallon, number of cylinders, and displacement, and then coloring lines according to number of cylinders, shows a distinct trend with regard to fuel economy and engine size. Cars with larger engines tend to have more cylinders. There aren't any four-cylinder engines, such as in the Toyota Corolla, larger than 150 cubic inches (also known as 2,468cc or 2.4 liters) in this data. Additionally, cars with those smaller engines tend to be more economical, ranging from around 21 to 33 mpg. Thus, smaller, four-cylinder cars tend to achieve better fuel economy. Eight-cylinder cars tend to be larger and more thirsty for fuel, while 6-cylinder cars compromise between fuel economy and engine size. Feel free to explore the mtcars dataset yourself in the Parallel Coordinates Explorer, or see what you can discover from your own dataset. Additionally, if you have a Exaptive account, you can add the Parallel Coordinates Explorer to your own studio, or edit it for your own purposes. If you don't already have an Exaptive account, you can sign up for our Community Edition free of charge.